Karen Rand Anderson graduated with honors from Rhode Island School of Design in 1977 with a BFA in ceramics, and in 2010 received her MFA in mixed media studio art through the Johnson State College/Vermont Studio Center masters program in Johnson, VT. She has completed residencies in Bulgaria through the Griffis Foundation/Orpheus Foundation, at I-Park Artist’s Enclave in East Haddam CT, and at Vermont Studio Center, and shows regionally and nationally in juried, invitational and solo exhibitions. 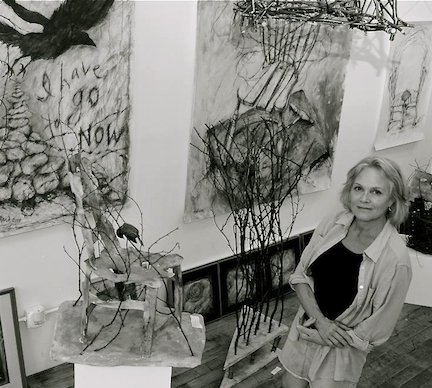 Her mixed-media sculpture utilizes natural materials, appropriated objects and charred paper; her large format works on paper often relate to her sculpture. The metaphor and imagery in her work revolve largely around the concepts of intimacy and relationship, evolution and the search for the spiritual. Anderson’s recent work focuses on an exploration of landscape, moving into abstraction, informed by intuitive mark-making, layering of color, gestural brushwork, and spontaneity. The mixed media paintings are colorful references to vista and memory, drawing the viewer into a personal experience of place. Please visit my blog on art+life, Cleaning Up the Studio. Contact: Feel free to fill out the contact form in the Guestbook to inquire about sales, join my mailing list, or leave a message. "The object isn't to make art; it is to be in that wonderful state that makes art inevitable."